I’m the last of the Goodwill Smackdown contestants – and I have to say – it was a bit of a challenge for me. I’m not really the thrifting or American Picker-type who can walk into a second-hand store and see dollar signs. I think it takes a special person with a lot of knowledge in knowing the value of things and what others might be willing to pay for it. That said – I rolled the dice and for the Challenge, I decided to rummage through a few nearby Goodwill stores to see what I could find. 5 Please comment for your chance at a $50 Goodwill gift card! At first – I was all about finding a brand new item that I could resell for more online. Everyone likes new, right? And, ironically enough, there were quite a few newer items at Goodwill. But, since the game is about buying low and selling high, I really didn’t find anything I thought anyone might go for at eBay or Craigslist. After several unsuccessful attempts and visits to Goodwill – I finally settled on a strategy. I would buy and sell what I know. For me, that’s not a lot to choose from. I know golf and I know art. So, I went looking around for older artwork or prints that might be worth something AND I was on the lookout for anything golf-related. While I discovered a few interesting pieces of artwork and older looking prints – nothing struck me as valuable enough that I could make a decent profit at. Then, I found the golf club bin and started rummaging through the clubs. 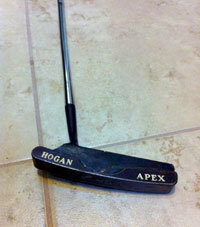 After a few minutes of searching, I happened upon an older Hogan Apex putter. If you know anything about golf, you have no doubt heard the name: Ben Hogan. Hogan was one of the best golfers of all time who had a lot of mystique surrounding him in the way he practiced / played the game. He swung the golf club better than anyone had before him and – to this day – people still hold him in high esteem. So, Hogan golf clubs are a brand name that many golf aficionados would appreciate – and many collect. Given the condition of the putter that I found (with its original grip and shaft), I thought I had a treasure. Goodwill priced the club at $2.99. I quickly got on the smartphone and Google’d the putter. I saw several had sold for around $20 – some even as much as $35! Certainly, I just punched my ticket to a Smackdown victory parade, no!? Please comment for your chance at a $50 Goodwill gift card! All right – so all three of us have bought our item at Goodwill – and now it’s time to sell. Who do you think will come out the winner and sell their item for the most profit? Any commenter on this past weeks’ posts is eligible to win. Thanks to Goodwill Easter Seals here in Minnesota for providing one $50 gift card that can be used at one of their Minnesota stores. If you don’t live in Minnesota (shame on you!) – we will be providing a gift card to a Goodwill near you or a thrift store of your choosing. Just comment to enter! Contest ends midnight (CST) on August 25th and winners will be notified the 26th. If Aaron sells on Craigslist or a local facebook page I think he will win. When you remove shipping from the equation I think the most profit will come from the golf club. I think Aaron might take this one with the putter. Great find and one that I would use. Jeans are always popular !! Go Laurie!! I pick up items at goodwill and double sometimes triple my money mostly using craigslist. Aaron has a great chance at it. Thank you for participating and voting! Contest closes midnight (CST) Sunday. It’s Aaron. Much better buy! I’ll say Laurie. I know a lot of guys who need basic work jeans, in their size, and at a great price. Sounds like it might be close, but I would have to go with Aaron. I think Aaron, with his knowledge of Golf, I think he has it! I think Aaron might have this contest In the bag. There are alot of golf fanatics (myself excluded, but know of several) and I could easily see the club making a nice little profit. That was an awesome find at an Incredible bargain! I’m voting for Laurie as her item was near the bottom in initial cost (making her ceiling much higher) and, if my wife has taught me anything, it’s that quality women’s jeans are way more expensive than I would ever imagine. Good luck to everyone, and I really like this contest. Cool idea. I will vote Charlie. It will be interesting to see who wins! I am going to put my vote in for Laurie. I don’t see the golf club selling right away, and everyone needs jeans! Since I enjoy thrift store shopping, I’ve enjoyed reading about your Goodwill Smackdown finds! Good luck to all, but do think Aaron will be the winner. Aaron has this one in the bag.. his strategy has proven itself to be successful time and time again. You guys all made great picks for the challenge. I hate to quibble but I think Laura and Aaron will be tied! Now watch and see Charlie win it..heh heh..
Great find! Sounds like there is money to be made if you have the time, talent and knowledge to invest. Aaron- sell on Craigslist. Trying to ship and package properly so as not to damage the golf club will be a nightmare. I listed 2 excellent condition pair of Lucky jeans on ebay that I found at my local Goodwill store- and lost my shirt on them. I had read a lot of info saying “auction listing” created the best price nearly all the time. Not my experience. I paid the buyer to take them, in essence. They were Lucky brand women’s – sold for .99 + shipping. I thought jeans would be a no-brainer and quick sell from my research. I may try again later and just list a price. That is my discouraging story. Good luck everyone. I think the golf club can be sold on CL. That will take shipping costs out of the picture. So…Aaron. I’m very interested to see how the Goodwill Smackdown turns out! I think Aaron will win because he did his research and knows what they are going for! Plus, it’s still in a good season for golfing. I’m going to say Laura just because jeans sell quick and easy on ebay and I think she will have the best profit margin. I would have said Charlie but that’s a pretty steep cost already in it. Good luck to all of you! I think Aaron will win, clothing sizes generally can covey correct fit. Whereas golf equipment can vary with the user’s grip, swing etc. too many factors and draws a smaller crowd of potential buyers. Shipping will cost more for the golf club as well. Buy what you know — good strategy! While I was in college, I bought items from resale shops and sold them for a profit online to support my social life. And buy food. My area of expertise was video games; the world of collectible video games was less known ten years ago, so it was pretty easy to find games worth well over $100 for anywhere between $5 and $20. Nowadays, most places are more aware of the value of video games and price accordingly. Although I do know that someone rather recently found a copy of Stadium Events at a Goodwill for less than $10. That probably resold for around $15k. I think the scrubs will probably get the most profit! I’m always hesitant to buy large items (like the putter) because I’m afraid people won’t want to pay the shipping. Would love to be proven wrong on that concept, though! I’d have to say Aaron as long as he can get it sold. Bit tougher to sell than a pair of pants but much more bang for your buck!